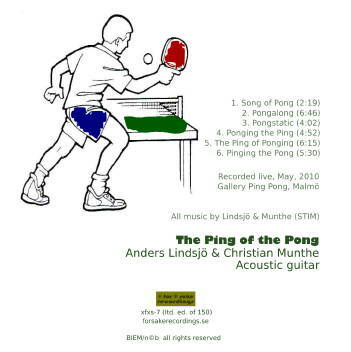 Anders Lindsjö & Christian Munthe: The Ping of the Pong (xfxs-7). Custom bubble-wrap cover. Limited edition of 150 copies. Guitar and guitar. Guitar and guitar. Guitar and guitar. Guitar and guitar. Guitar and guitar. Guitar and guitar. 20 years after meeting electrically when Munthe lent his wired axe to a few gigs with the 1990's impro/rock/funk combo Maxcolic (besides Lindsjö on electric bass, featuring also Raymond Strid and Mats Gustafsson), Lindsjö and Munthe reunites on the other side of life and find each other obsessed with a similar vision of the sounds of archtop acoustic guitars hung on the walls of this micro cellar gallery in Malmö. The exhibition over, the canvases are now shipped to keen ears for a minor fee.